In this post https://neilsec.com/ctf/vulnhub-lazysysadmin-1-ctf-attempt/ I had a crack at the LazySysAdmin VM from VulnHub and found the hidden flag. However it seemed a bit odd/easy to just enumerate some website directories and find a password, whilst ignoring all the WordPress and myphpadmin bits. So I thought I’d have another look at it to see if there were other ways of rooting the box. So going back to the WordPress site, I had a go at the login page using the credentials. WPSCAN had earlier told us that Admin was a valid username and so I tried the database password and got in. The eagle-eyed will notice the IP address has changed but that’s just me putting the VMs on a different network. 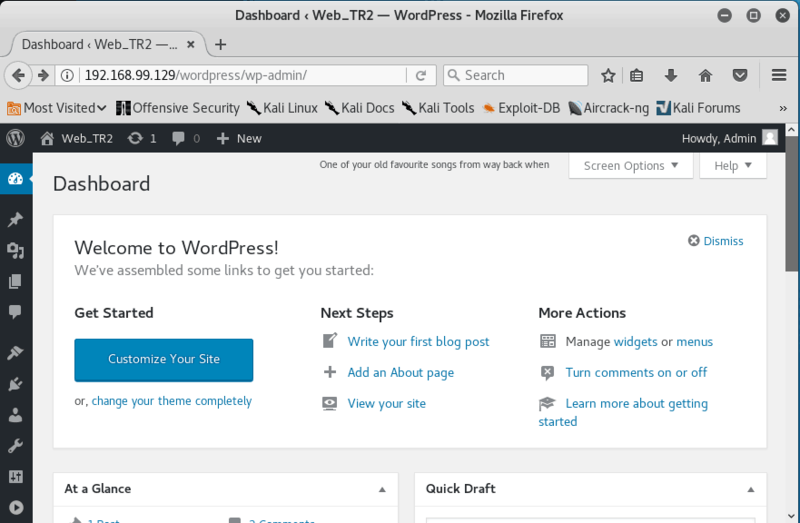 OK so being in WordPress doesn’t allow automatic access to the server it’s on. So we need to get some code and what with it being an php driven app, a php shell would seem appropriate. I used one on this CTF that worked nicely so I’ll have a go with that. How to get it in though. The obvious target is WordPress’s plugin system which accepts php natively. So a bit of research required in that direction. Now I just need to zip it up and see if wordpress will accept it as a plugin. Now drop the python command I used on a previous CTF to spawn a proper tty shell and we have an interactive shell. I did check out the phpmyadmin page but the credentials didn’t seem to have any ability to do anything useful so I’ve not bothered reporting on that.